In the Netherlands newly qualified midwives (NQM) have to work in practice, without formal mentorship and support. 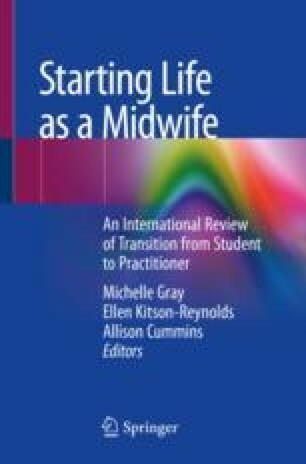 Midwives are fully qualified, autonomous medical professionals when they complete their bachelor’s degree. Dutch NQM depends on informal support systems, mostly provided by colleagues and peers. NQMs seem to initiate informal support by themselves. For primary care NQMs, colleagues are sometimes employers and therefore not always safe for deliberating their questions. Bologna Working Group (2005) Framework for qualifications of the European higher education area. http://ecahe.eu/w/index.php/Framework_for_Qualifications_of_the_European_Higher_Education_Area. CBS. Minder thuisbevallingen. 2009. https://www.cbs.nl/nl-nl/nieuws/2009/08/minder-thuisbevallingen. Accessed 02 Feb 2018. Department of Education. Wet op hoger onderwijs en wetenschappelijk onderzoek. 1992. http://wetten.overheid.nl/BWBR0005682/2017-09-01. Accessed 17 Nov 2017. Department of Justice. Wet op de beroepen in de individuele gezondheidszorg. 1993. http://wetten.overheid.nl/BWBR0006251/2017-08-01#Hoofdstuk1. Accessed 17 Nov 2017. Ministry of Health Welfare and sport the BIG-register. n.d. https://english.bigregister.nl/about-the-big-register. Accessed 28 March 2018. Nederlandse Overheid. Besluit van 3 juli 2008, houdende regels inzake de opleiding tot en de deskundigheid van de verloskundige. 2008. https://zoek.officielebekendmakingen.nl/stb-2008-300.html. Accessed 12 Feb 2018. The Royal College of Physicians and Surgeons of Canada. CanMEDS: better standards, better physicians, better care. 2015. http://www.royalcollege.ca/rcsite/canmeds/canmeds-framework-e. Accessed 28 Jan 2018.